My body is slowly succumbing to the course of time, to the insistent, constant force that seeks to whittle and pry and break and bruise, to the inevitable process wherein these ashes will find their way back to ashes. It’s sad, really, at such a tender age to be falling apart. I didn’t intend for it to be like this, but this is my first time in this aging process, and I’m no longer in control. I’m just a guy with creaks and cracks, and while others put up a most impressive facade, I’m nothing, really. I feel this way mostly because of my trip last week, a trip that started fine, included some wonderful skiing and the smiling faces of my children, and ended with my ear pressure being locked somewhere around the Vail Summit. After driving deep into the far away horizon where the Denver International Airport hides, my ear pressure was the same. Likely comfortable around 10,000 feet, but now I was at 5,000 and the pressure of those 5,000 feet was constant and unavoidable, ringing and pounding and bullying my inner ear. The flight would cure this, I figured. When I landed at Milwaukee it was obvious then that my previous attempts to calm my worry were in vain. The pressure built, my right ear finding some form of normalcy at 900 feet, but my left ear still stuck in the mountains. Certainly it wouldn’t last the night, but last it did. And the next day it would subside, obviously. But it didn’t. For sure the following day things would be fine and my 10,000 foot ear would slowly slip down to 900 feet. No. Such. Luck. And so I write this morning, contemplating who might be my Gaugiun, but also contemplating the state of the entry level lakefront market on Geneva Lake. That market is one that I’d like to call our most interesting, our most confusing, our most obvious. But none of that is true, because all lakefront segments are that way, they are at once easy to understand and overtly complicated. They are nothing at all but everything, easy to dissect and explain until they aren’t. The entry level market, however, has some unique intracacies that are on display today. Notably, is there a top for this particular market? Is the land worth what the land is worth and then the house might be worth whatever lofty price someone, someday, assigns to it? Let’s consider a few things first. Not all entry level properties are created equal. A 50′ lakefront lot in Cedar Point Park that might be 300′ deep is not the same as a 50′ lot in the Lake Geneva Highlands that might only be 180′ deep. I could sell a 50′ lot in Cedar Point right now for more than I could sell a 50′ lot in the Highlands. That’s not anything but the obvious and simple truth. That’s because Cedar Point has proven the ability to sell re-built (whether remodeled or new construction) homes far above the cost of the dirt and the Highlands has not. In fact, fantastically improved homes in the Highlands rarely sell in excess of $1.5MM. Another example of this is on Walworth Avenue in Williams Bay. This street is a nice enough street, with some condominiums and some entry level lakefront homes with very deep lots. Yet for all that depth, the market there has always struggled to sell anything over $1.5MM. In fact, a 100′ lakefront lot sold there for $1.2MM a few years back, at a time when a 50′ lot in the Highlands would have sold for similar dollars. If Walworth Avenue offered you a $1.2MM lakefront house you might think you’ve found something rare and incredible, when in fact, you’ve found something at nearly the top end of that individual market. Why is that the top end? Because you really can’t buy a tear down or supreme fixer upper on Walworth Avenue for $1.2MM and expect you have any margin in your all-in investment. The same theory applies to most locations on the lake, excepting Glenwood Springs. In Glenwood Springs, the lakefront homes aren’t even true lakefront homes, yet an entry level home will sell for $1.2-$1.5MM and then the buyer may indeed tear it down. Does this make any sense? Well, actually, yes. Homes in Glenwood Springs have sold in excess of $2.5MM, and such a sale is not an anomaly. At the same time, a 50′ lakefront lot in the Highlands or on Walworth Avenue with actual, real, private frontage, would struggle mightily to achieve even $2MM, let alone $2.5MM. As I was showing lakefront homes yesterday I thought about this market. I thought about the top end. I thought about where these prices might be able to go. And then I realized there’s likely a disconnect between what I think is reasonable and what a few individual buyers might think is reasonable. If I’m buying a tear down in a market that I believe to be capped in the mid $1s, I know that I’d want to have some margin for my effort. I don’t want to spend $1.5MM and a year of my life stressing out over a project that in the end will perhaps be worth $1.5MM. I want to spend $1.3MM to get to the finish line where a $200k equity bonus might be awaiting me. But perhaps that’s just me. And perhaps that’s just this 10,000 foot ear talking. I'm David Curry. I write this blog to educate and entertain those who subscribe to the theory that Lake Geneva, Wisconsin is indeed the center of the real estate universe. When I started selling real estate 22 years ago I did so of a desire to some day dominate the activity in the Lake Geneva vacation home market. With over $270,000,000 in sales since January of 2010, that goal is within reach. 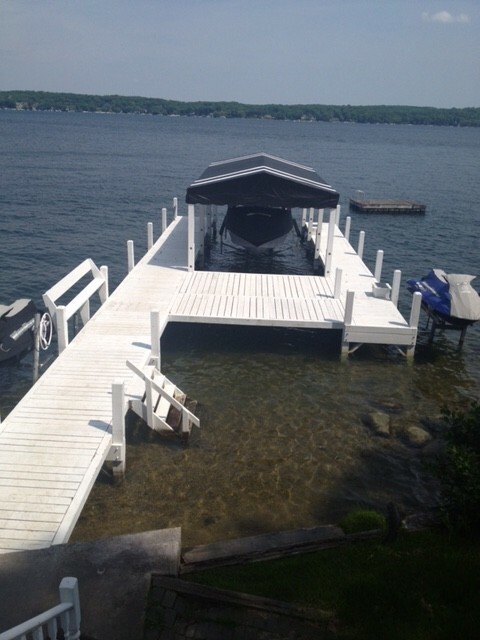 If I can help you with your Lake Geneva real estate needs, please consider me at your service. Thanks for reading.